iMindMap 9 is designed to give your thinking complete flexibility. Boasting four different views, Fast Capture, Brainstorm, Mind Map and Presentation View, you can choose how you want to work. In addition, it is integrated with some of the most popular tools available so you can save and open your Mind Maps in more places than ever before. 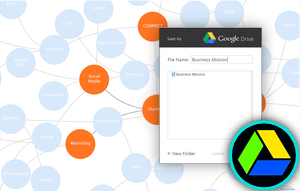 Upload your iMindMap files to file storage and synchronisation service Google Drive. Keep them in one, easily accessible space with your other files to manage your workload with ease. Dropbox automatically syncs your files across all of your devices. 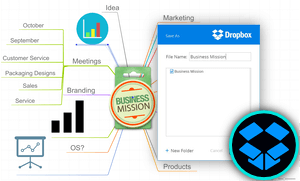 Save your iMindMap files to this file hosting service to access them wherever you are and share with others – even if they don't have a Dropbox account. 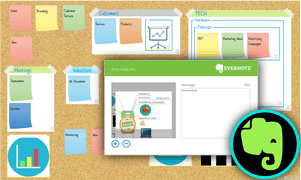 Create images of your Mind Maps or brainstorms in iMindMap and share them with note-taking and task management tool Evernote to give the details of your projects visual appeal.